Qaj Hedjet is a king come out from the nothingness of four thousand and six hundred years. Until 1968 this name had no sense either for the more than 150 years old egyptology, or for the long tradition of annals and king-lists compiled since the Old Kingdom and throught the New Kingdom up to the Greek period. Not a piece of tomb-relief, statuette, graffito, or monument had ever handed down such name. It's always amazing to discover previously unknown kings, even, and especially, in the most mysterious ages of history, as the Early Dynastic Period is. The style of the relief and the skillness of its lines are the reasons for the widespread convinction that we have to do with a III rd dyn. piece [rather than with one of Qa'a (Ist dyn.) or of the FIP as it has been formerly advanced]. We can easily see the carving evolution in comparison with the Wadi Maghara III rd dyn. reliefs; therfore it is justifiable a datation to the half or end of this dynasty for the reign of this king and his stela. Another parallel can be drawn with the six panels from the underground galleries of the Step pyramid complex of Netjerykhet at Saqqara (see here, bottom of the page). The lines of the king's face (forehead-crown, beard, mouth, but the same goes for the whole body) are a more developed variant of Sanakht, Netjerykhet and Sekhemkhet reliefs. The general treatment of the body of the Third Dynasty kings is, to a certain degree, somewhat sqattier, heavier, rawer and gives impression of more stability and authority than Khasekhemwy's (?) relief from Gebelein (now in Turin and Cairo) which portrait a taller and leaner king, more dynamic and whose body details are more equally balanced in comparison with those of the kings up to Snofru, wherein the reliefs show more careful attention for the face/head, leaving the rest of the body at a cruder stage of definition, with fewer decorative particulars. Possibly Djoser is the less extreme in this artistical trend (Khasekhemwy's influence? ); Qa Hedjet produces a shift towards smoother forms more in line with the IVth dynasty techniques (the sitting-Snofrw Dahshur stela is the further step of change: see the hands, the whole face profile; but indeed the general conformation and proportions of human shape and of hieroglyphs heavily echoes the Third Dynasty models, and a similar progress is also traceable in the statuary). The modeling of the Horus' head in the Louvre stela has no parallel, to my knowledge, in this early period. On it the king wears a short skirt, the false tail and the Upper Egypt crown; he brings a pear-headed mace and a reed in his hands and faces an anthropomorphic Horus whom keeps one hand on the king's shoulder and the other one on the left arm (in a similar posture is the goddess Seshat before Snofru in the Funeray temple of the Rhomboidal Pyramid of Dahshr, cfr. A. Fakhry 'The Monuments of Snofru ... II. The Valley Temple pt. I' 1961, fig. 84; Thomas Schneider in S.A.K. 24, 1997 fig. 5.1). Above the two figures, facing the falcon topped Serekh with Horus name, there's another falcon and a short sentence: "Horus in the Hwt 'Aa" (Great Temple of Heliopolis; see Kahl et al. 'Die Inschriften der 3. Dynastie',165 and Fischer, Orientalia 61,143). 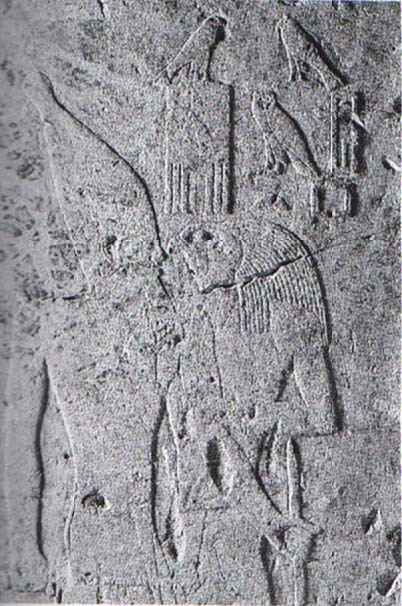 The material used is limestone and the figuration is plainly eroded but the lines' sure touch (Horus' face, the king body, the hieroglyphs) is evident, showing a slight progress compared with the mentioned limestone stela fragment of the Turin Museum from Gebelein (dated to the II-III dyn. see Smith 'A History of Sculpture and Painting in ... 1946). For the stela of the Louvre: Vandier, in: C.R.A.I.B.L. 1968 p. 16-22; Ziegler 'Catalogue des stèles, peintures et reliefs égyptiens de l' Ancien Empire et de la Première Période Intermédiare - Musée du Louvre' 1990 p. 56; Blumenthal, in: ZAS 130, 2003, 1ff. (excursus p. 25-26). Lacking the evidences for a Horus name of the predecessor of Qa Hedjet, Neferkara, it could be hypothized that these names belonged to the same sovereign; the few traces they left make it possible that both these kings could have been immediate predecessors of Huni. Worth of note that in the III rd dyn. corpus of inscriptions (Kahl et al. 1995, following D. Wildung 'Die Rolle..' 1969 p. 101 n.4) 'Qa Hedjet' is considered the Horus name of Huni: infact this latter king's Horus name has never been found, therfore this could even be correct; but the fortuitous and meagre attestation of these kings' monuments and names lead us to think that the third dynasty sequence could consist, even more than the second dynasty, of various further kings of whom nothing has remained (Nabil Swelim numbers 9 kings in Dynasty 3). Kahl in 'S.A.H. '(1994) p. 7-10 had positioned Qa Hedjet after Huni (according to him the dynasty was closed by the mysterious BA who Helck placed at the end of the first dynasty after Qa'a and Sneferka). Peter Kaplony ('Rollsiegel A.R.' I Mon. Aeg. 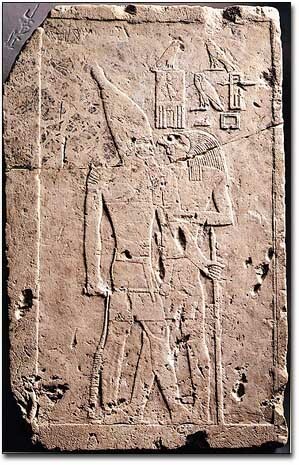 2, 1977 p. 155 n.271) thought this stela (and king) belonged to the Ist I.P. Also a middle IVth Dynasty date has been proposed for this stela. 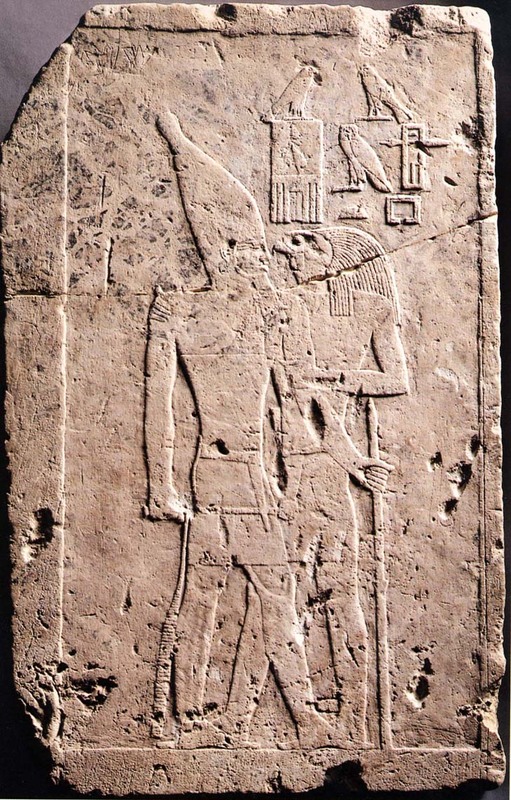 The fact that this name is still unattested at Elephantine could be either a clue that his reign was a very short one or that he was known with the cartouche name of Huni (Njsut Hw) or that of Nebka; it is also possible that he was a known late 3rd dyn. ruler who changed his Horus name (cf. the unfinished excavation of Zawiyet el-Aryan North with an iscription "Neb-Hedjet"). We must Keep in mind that at least two enclosure walls at Saqqara (recently reanalyzed) west of the Step Pyramid complex (Ptahhotep or Great Enclosure) and south west of Sekhemhet's (Gisr el Mudir), are unfortunately deprived of clues which could indicate their builders' names (their mid-late IInd dyn. date is widely accepted and it could hardly be lowered to the 3rd dyn.). The ephemeral kings of the 'Sekhemhet to Huni' dark age were once thought more suitable as builders of these stone masonry enclosures because it was thought that Netjerykhet/Djoser had been the first king to make a massive use of stone; and the stone vessels typology of the fragments recovered in West Saqqara looked closer to the Third dynasty shapes than to the earlier ones. But now that proofs start to appear for an higher datation of the enclosures, prior to Djoser, we are left in the shadow as for the complete absence of the smalles trace of architectural remains for the mid-late Third Dynasty sovereigns. But we can't rule out the possibility that this period may reveal new royal names as it has been the case with Qa Hedjet; anyhow the duration of the III rd dynasty shouldn't fluctuate beyond the 70 ± 20 years. M. Baud has recently proposed a very short period for this dynasty (to which he ascribes only 5 rulers): c. 50 years; considering the monuments the sovereigns have left, this is the minimum duration possible. That's all that we can say about Qa Hedjet and maybe it has been also too much. I hope new elements may appear to enlighten this shadowy figure and/or his proposed relations with other kings of the period.